Last week we were paddling in the Boundary Waters Canoe Wilderness in northern Minnesota. It's backcountry camping, but that doesn't stop us from eating veggie-filled foods. Dela said it best, this is a delicious time of year. So much beautiful color and so many delicious varieties at our fingertips this week. And, tomatoes! I love tomatoes. Of all the produce I yearn for in the summer, red, juicy tomatoes are the ones I miss most. Maybe it's because there are all those insipid grocery store tomatoes and pale greenish slices on restaurant burgers sitting there, reminding me of what I'm missing. In any case, summer tomatoes are here now and until they're gone, we'll be celebrating them with fresh, perfect BLTs, beautiful panzanella and caprese salads, and French tians. Over the last two weeks we've been pretty busy, but we've found time for some creative CSA eating along the way. A couple weeks ago I wrote about adapting the radish pizza recipe that I shared to fit other veggies. Upon the arrival of the first summer squash, we did just that, subbing roasted patty pan and zucchini for the radishes and adding a basil garnish to the top. This Friday Blake and I stepped away from our day jobs to put in a bit of volunteer time at the farm. What started as a drizzly grey day in Madison became a welcome cool day on the farm. After greeting Dela and meeting Elise, Scotch Hill's intern for the next few weeks, we headed to the gardens to begin work for the day. Heading to bed on Tuesday night, we knew to expect rain, maybe a little thunder overnight, but we weren't at all expecting the storms that rolled through our neighborhood around 1am. Soon after the rains started, lightening flashed outside like a strobe light gone amok and punishing 70 mph winds whipped through the trees surrounding our home. A lightly sprained ankle brought a quick end to last weekend's 30 mile backpacking trip, but it quickly became a weekend of appreciating the goodness of strangers and embracing the unplanned. The birds are signing outside my window as I type this blog post, drawing my attention away from my computer and outside into the cool afternoon. Soon I'll be packing up the car and heading out for a backpacking trip on the Superior Hiking Trail on the Lake Superior shoreline in northeastern Minnesota. Soon I'll be climbing up the ridgeline surrounded by birch and aspen, then descending into the canyons of the powerful rivers that run into the lake. It's another cool Thursday in Madison as I write this week's post. I, for one, am grateful for the brief reprieve from the 90 degree heat. With the rains this week, our farmers are expecting a surge in weed growth, so if you find yourself with nothing to do this weekend or a few hours to spare, consider giving them a hand! Freeing young vegetable crops from the invading weeds is a surprisingly satisfying task. It's a cool, rainy day here in Madison, but the forecast promises summer temperatures for the weekend. I'm sure the little Iglheart cherry tomato plant we added to our tomato garden last week has appreciated the sunshine and now the gentle rain. This week's parsley will get potted up and join the other herbs on our porch soon. 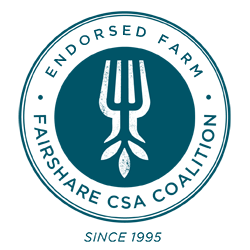 Spring vegetables pair really nicely with eggs--especially if those eggs happen to be wholesome farm eggs delivered fresh from Scotch Hill Farm, *nudge nudge*. Think of all the spring vegetable frittatas (way easier than they sound), quiches, and omelettes! I seldom follow recipes for egg dishes, but they can be helpful for getting a baseline and some basic techniques. I'm writing again this season to share information, recipes, and thoughts I've gathered about making the most of your CSA veggies throughout the season. For anyone new to this blog, I'm Megan. (That's me to the right). My partner, Blake, and I have been subscribers to Scotch Hill Farm since 2012. I love reading about food, trying new recipes, and experimenting with different approaches to cooking. I can't believe it's week 7 already! Time always seems to escape me during the summer months. Our recent shares have brought with them glimpses of summer's peak bounty: cucumbers, green beans, the first summer squashes. Spring has arrived! And with it comes some beautiful produce courtesy of our dear friends at Scotch Hill Farm. It is such a joy to see fresh, local produce return to my kitchen after the long winter months. Now it's time to enjoy the delicate, fleeting flavors of spring before they cede to the heat of summer. Although I am a fan of bold flavors, spring provides an opportunity to reset our palates. I love bracing vinaigrettes and pungent sauces, but for spring produce milder ingredients shine. After the heaviness of winter cooking, I see spring as a time to shorten ingredient lists and use a lighter touch in my cooking. With that idea in mind, I've collected some recipes for the items in our shares thus far. Just when I thought patty pan squash were cuter than any other, I opened my bag to find two perfect little lemon squash! The scallops on patty pans are quite appealing, but these little lemon doppelgangers, too, have a lovely shape. I haven't decided what we'll do with our yet, but I won't be admiring them for long! This time last week, I was paddling cross Clearwater Lake in the Minnesotan Boundary Waters, headed back to civilization and fresh food. It was the end of 5 days of pristine wilderness, canoeing, and dehydrated boil-in-bag foods. Although we often take our shares with us on camping excursions, the demands of this trip called for something different. Needless to say, I was ever-so-anxious to bring home our share this week and dive back into good, fresh foods. Tomatoes this week! Fresh, local tomatoes are a true treat. I've been dreaming of panzanella and caprese salads, fresh tomato sauces, and sliced tomatoes with salt for months. Green beans, one of my personal summer favorites, have arrived this week. I love their color, their snap, their subtle sweetness. Summer squash, too, is another long-awaited vegetable. All early summer vegetables have an easiness that lends them to the kinds of low-maintenance foods we crave during the chaotic summer months: sliced raw into salads, tossed in oil and grilled, folded into a pasta dish. All the veggies in the bag this week are great ingredients for backyard barbecue fare or quick summer meals before the ballgame. This week snow peas, garlic scapes, and Swiss chard join the spring bounty. For Chicago subscribers joining the delivery schedule this week, the recipes for bok choi and asparagus in previous weeks' posts might also be intriguing. Week 2 is here and I'm back with a few more recipe ideas for our CSA community. More springtime vegetables in our bag this week, including some lovely asparagus.